Over the past month, the Jefferson Center has seen an amazing outpouring of volunteers to help grow our farm! With the help of over 90 volunteers and dedicated community members the Jefferson Center was able increase the number of garden beds to grow more produce for its vastly popular free produce stand. Volunteers who came out to the Jefferson’s Share the Love event were able to help us build six new garden beds, ten new pea boxes, plant hundreds of seeds for use to give away at our produce stand, and helped maintain our current garden plots. Special thanks go out to Caterina Lewis-Perry for coordinating the volunteers for the event! The Jefferson was also fortunate enough to host a volunteer work day on March 12, in which the men from Lambda Theta Phi Fraternity of HSU, UC Davis, and USC Chico helped to build a new three stage compost bin, plant potatoes, and plant several new beds! The Jefferson Center would like to thank every community member and volunteer who has help to make the gardens a true success! We are starting work on our Multicultural Garden in Loleta on Sat. March 15th from 9am - noon. We will meet at the St. Joseph Community Resource Center, located on Loleta Elementary School grounds. The garden will be placed on the field behind the office. We hope you can join us! 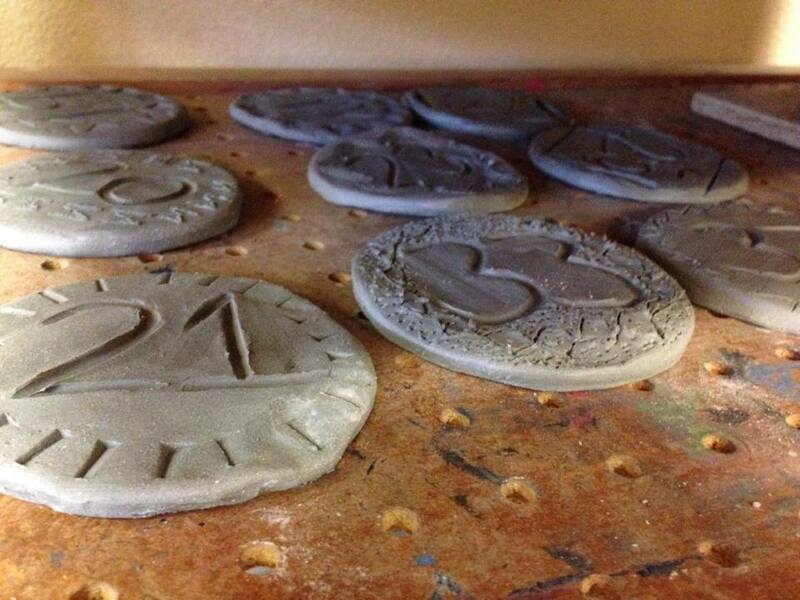 Arts in the Afternoon, City of Arcata Recreation’s afterschool open art studio for youth in 6th-12th grades, designed ceramic identification markers for the plots at the Bayside Park Community Garden. Now plot holders and community visitors can easily identify plot locations. The Bayside Park Community Garden has individual garden plots open for the upcoming season. Grow organic fruits, vegetables and flowers for family use. Annual Fee for a 4’ x 25’ plot $75 / $85 Non-Resident. For more information contact Arcata Recreation Division (707)822-7091 or download a application packet from the website: www.cityofarcata.org/rec. There is room for more gardeners at McKinleyville Community Garden at Pierson Park. Plots are 3ft by 10ft and rented for around $25 a year. There is also communal space available for gardeners to tend, as well as access to water and soil amendments. For more information about the garden or to rent a plot please contact Gary at (707) 839-3214 or the McKinleyville Parks and Recreation office at (707) 839-9003. This month's Community Gardener "Meet and Greet" is on Wednesday March 19 from 5:30 - 6:30 pm at Manila Community Center. Come network with local gardeners, talk with local experts, enjoy yummy food, and get free gardening resources. Come early for North Coast Community Garden Collaborative's monthly meeting from 4:30 - 5:30 pm- anyone is welcome! The Center is located on Peninsula Drive; from the 255 turn onto Pacific Ave heading toward the ocean. The road will veer left and turn into Peninsula Drive and the Center is on the right. Please email Debbiep@nrsrcaa.org or call (707) 267-0924 with questions or for more information, and hope to see you there! Two great community events for gardeners are in need of volunteers. On Saturday March 29 the Humboldt Permaculture Guild hosts the 16th Annual Seed and Plant Exchange at the Acata Commuity Center from 11am to 4pm. Bring saved seed or plant starts if you have them. Free event with music and workshops. Volunteers are needed before, during, and after the event as well as the day before the prepare food. 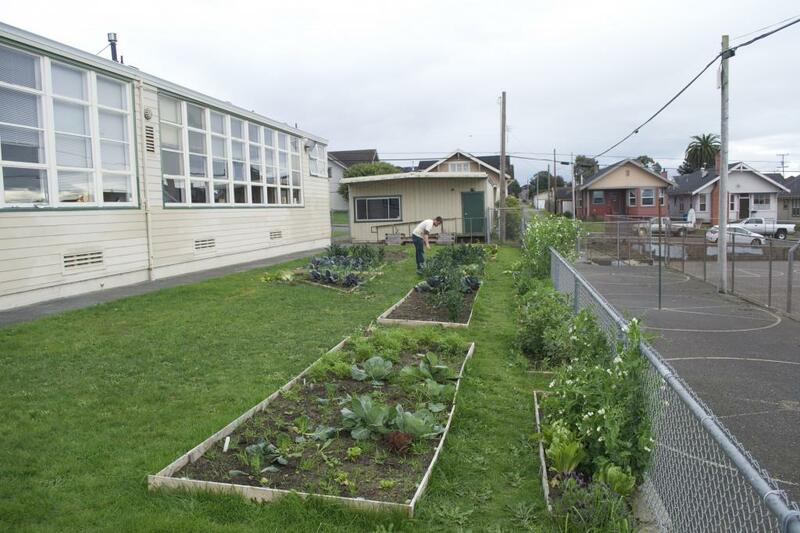 On Saturday April 19 North Coast Community Garden Collaborative is helping plan a Sustainable Living Skills Fair at Jefferson Community Center in Eureka. The Fair will provide a forum for sharing skills around gardening, food preparation, and permaculture, as well as other skills and resources for creating healthy, safe, resilient and self-sufficient families and communities. We are in need of volunteers to help outreach for the event like hanging fliers as well as before, during, and after the event. Please contact DebbbieP@NrsRcaa.org or (707) 269-2071 for more information or to sign up. More info is on our website and details about the Fair will follow in the next Gardening Gazette. Mark your calendars for both events as these are ones you don't want to miss! Be a Docent for "Farm to School"
Community Alliance with Family Farmers is looking for members of the community to become farm to school docents. These volunteer docents will help lead farm field trips (at Shakefork Community Farm and DeepSeeded Community Farm) for 2nd and 3rd graders.Two mandatory trainings will be provided in April; no experience is necessary. Please contact meredith@caff.org or (707) 826-0233 for more information. At top: The new beds at Jefferson Community Center on Eureka's westside are already producing an abundance of food. Above: Lovely new plot markers created for Bayside Park Community Garden by Arcata youth. - Garden Build Day in Loleta: TOMORROW Saturday March 15 from 9am to noon at the Loleta Elementary School, 700 Loleta Drive. Join us as we create a multicultural garden. - Garden and Cooking Classes: TOMORROW Saturday March 15 at Redwood Acres Fairgrounds. Garden class from 10am to 1pm and cooking class from 2pm to 5pm. To RSVP call (707) 443-3037. - Fruit Tree Planting Event in Arcata: Sunday March 16 starting at 10 at 3301 Boyd Road. See article (opposite) for more information. - Free Food Handling Class: Tuesday March 18 from 1:00pm to 3:00pm at Karuk DNR in Orleans, sponsored by Karuk Tribe. RSVP at (530) 627-3446. - Gardener "Meet and Greet Event: Wednesday March 19 from 5:30 - 6:30 pm at Manila Community Center in Manila. A chance for gardeners to network, talk with local experts, and get gardening resources. Light refreshments provided. Come at 4:30 pm for the monthly meeting of the North Coast Community Garden Collaborative. Please email DebbieP@nrsrcaa.org or call (707) 267-0924 for more information. - Seed and Plant Exchange: Saturday March 29 from 11am to 4pm at the Arcata Community Center. For more information or to volunteer please contact DebbieP@nrsrcaa.org or (707) 269-2071. - Grafting Workshop and Scion Exchange: Sunday March 30 in Bayside. Take home a grafted fruit free, with expert Sam Polly. For more information contact (707) 672 - 3102. - Sustainable Living Skills Fair: Saturday April 19 from 9:30 am to 4 pm at Jefferson Community Center, 1000 B St in Eureka. Learn skills around gardening, food prep, and more. No admission; donations accepted to cover event costs. Free lunch for first 150 attendees and a supervised play area for children will be open. For more information or to volunteer please contact DebbieP@nrsrcaa.org and visit northcoastgardens.org. The Food and Farm Working Group welcomes community members to come help plant a food forest on Sunday, March 16, 2014 at the Arcata Courtyard Circle Apartments (the first solar powered apartment complex in Humboldt) – Affordable Living Community. The event will start at 10 am with a potluck and will last until all of the fruit trees, shrubs and native plants have been planted. Arcata Courtyard Circle Apartments is located at 3101 Boyd Road (just off Giuntoli Lane and the 299) and is on the bus route. The purpose of this event is to build and strengthen our community one fruit tree at a time. This is the first of a series of projects we intend to hold here in Humboldt. Volunteers are requested to bring a dish to share at the potluck, and bring gloves, a shovel, and a water bottle as this is a waste free event. The food forest will consist of dozens of peach, grapes, Chilean guava, blueberries, tayberries, marionberries, fuzzy kiwis, pears, native plants, cherries, oranges and more – all are perennials that grow well in our local climate. The Arcata Courtyard Apartments is a great community of families and seniors, some of which are enthusiastic gardeners with raised beds and a variety of edible plants that are already in place. We invite you to join us and bring a potluck dish to share, some gloves, a shovel, and some elbow grease to the Courtyard Circle Apartments, 3101 Boyd Road, Arcata, on Sunday March 16 2014, at 10 am for a day full of community and gardening. For more information contact Andy Sehic at 707.826.2935 or andysehic@hotmail.com. Gardening Gazette is a free publication of North Coast Community Garden Collaborative, a support network of and for community gardeners working together to increase access to fresh, healthy, and culturally appropriate foods for all North Coast residents.To learn more please visit www.northcoastgardens.org, email DebbieP@nrsrcaa.org, or call (707) 269-2071. Copyright (C) 2014 North Coast Community Garden Collaborative All rights reserved.